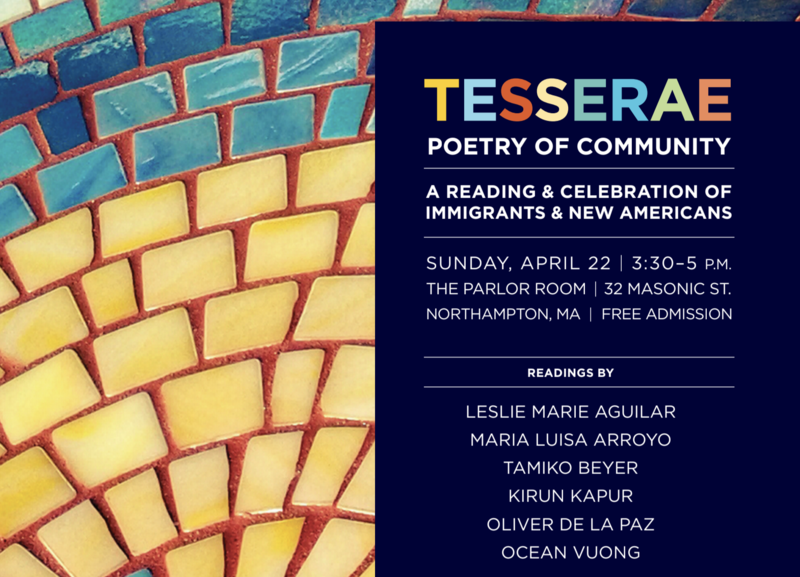 The Common brings you a special two-part series as a preview to Tesserae: Poetry Of Community – A Reading & Celebration Of Immigrants & New Americans, coming up on Sunday, April 22 3:30–5pm at The Parlor Room in Northampton, MA; free admission. Part One – featuring poems by Kirun Kapur, María Luisa Arroyo, and Ocean Vuong. Begin with a seed. Begin with the father and the mother, your first Adam and Eve. Begin with what falls from the tree: you can live on bruised and sweet. Begin with a monsoon breeze, begin with a flood, begin with miles of silk and mud and the wings of cranes and the stilt-like legs of a house with no one left inside, with a young wife burying her sons and books riding the tide until they’re caught and their philosophies dried out on laundry lines. Begin with a pen, begin with a cage. Begin with the memory of what they said while you tried to turn your face away. Begin with bargains, with stains, the names of towns built over towns built over graves, begin with your life burned down. With the god who hasn’t been seen since the burning bush and the goddess who steps into the flames like a housewife into a dress, or a fairy tale of hair so long that love climbed up—begin by putting your mouth to the mouth of your dreams. Begin with tendons, teeth. Begin with what never goes away: a highway pricked by gravel and stars, low beams on wind and trucks and emptiness. Begin. It starts with being, ends like a ringing bell: Begin. Begin. Ring your self. It was hard not to notice the style of him. We were all mesmerized by the smile on him. Snaps, sexts. He might. I might not. Friends teased, Take a pic of your thigh for him. There’s a strip mall, a steel mill, the long Veteran’s Bridge. The white picket grin was the lie of him. A basement. The music. Coats draped on the couch. I kept drinking and thinking, don’t be shy with him. He posed for the camera, his hand on my neck. I lay still underneath the hard guile of him. I dream of the girl who’s surviving him. What did you expect is the cry from them. These are the facts from the trial of him. In Delhi, a bus. In Houston, a bridge. There’s New Bedford, Toronto, Dubai for him. For a girl to be innocent she has to be dead. The newspapers await a reply from him. My name is redacted, it no longer applies. I end every line writing him, him, him. Kirun Kapur is the winner of the Arts & Letters Rumi Prize in Poetry and the Antivenom Poetry Award for her first book, Visiting Indira Gandhi’s Palmist (Elixir Press, 2015). Her work has appeared in AGNI, Poetry International, FIELD, Prairie Schooner and many other journals. She has taught creative writing at Boston University, Brandeis University and is currently a visiting writer at Amherst College. Kapur has been awarded fellowships from The Fine Arts Work Center in Provincetown, Vermont Studio Center and MacDowell Colony. She is the director of the New England arts program, The Tannery Series, and serves as Poetry Editor at The Drum Literary Magazine. She was recently named an “Asian-American poet to watch” by NBC news. Kapur grew up in Honolulu and now lives north of Boston. Read more on The Common Online – Some Voice Has Spoken: an interview with Kirun Kapur. between father and son, his mother’s silence. Let’s pose. between our teeth, pray to my God, his Allah for mercy. Whenever I write in my journal, I am whole. I don’t have to choose between my four tongues. In which language do I dream? It depends. Am I teaching or making love? Mi lengua materna sigue ardiendo. My mother tongue still stings, burns. & island Ricans who compliment my accent. my home lives in the air, en mi lengua materna. between us foreigners loving in a Dortmunder Hochhaus. your voice – both instruments – won’t break. Educated at Colby, Tufts, and Harvard in German, her third language, María Luisa Arroyo enjoys facilitating workshops on ekphrastic poetry, multicultural/multilingual code-switching poetry, and the ghazal as a poetic form. Calyx: A Journal of Art and Literature by Women and WomenArts Quarterly Review are among the many journals in which her poems appear. Her poetry collections include Gathering Words: Recogiendo Palabras (Bilingual Press/Editorial Bilingüe, 2008) and the chapbook, Flight (Thousand Hands Press, 2016). Her awards include receiving a Massachusetts Cultural Council Poetry grant and being named a 2016 NEPR Arts & Humanities Award recipient. Currently, María Luisa is Assistant Professor of Writing & First-Year Studies at Bay Path University. like a miniature moon behind her hair. like a cord unraveled from the lovers’ ankles. the earth with red hooves. & I am your son. Poet and essayist Ocean Vuong is the author of Night Sky with Exit Wounds. Born in Saigon, Vietnam, he immigrated to the US at the age of two as a child refugee. He lives in Western Massachusetts and teaches at UMass Amherst’s MFA for Poets & Writers program.